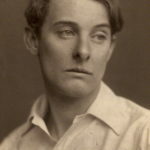 Alfred Douglas nicknamed Bosie, was a British author, poet, translator, and political commentator, better known as the friend and lover of Oscar Wilde. Much of his early poetry was Uranian in theme, though he tended, later in life, to distance himself from both Wilde’s influence and his own role as a Uranian poet. Politically he would describe himself as “a strong Conservative of the ‘Diehard’ variety”. "All good poetry is forged slowly and patiently, link by link, with sweat and blood and tears."